This does not describe Allamagoosa or myself at all. Nope, not even the least little bit. Since she’s a fan of anime and many things Japanese, does that make her my Mandarin Plum? Does Early Sexual Experience Affect Later Drinking Behavior? In Hamsters. Um,wait…in hamsters? Seriously. In hamsters. Perhaps that can be the new tag line for scientists. You know how you are supposed to add “in bed” after a fortune cookie? So, your fortune cookie says “You will soon come into a lot of money” and you add, “in bed!” Hilarity.From now on, medical studies have to end with “in hamsters” to make sure we all understand just how tenuous the conclusions are. There’s a metaphor in there somewhere but I’ll let someone else make it. …in hamsters. How do they hold those red Solo cups in their little paws? Posted in ...The Hell Is This?, ♫ ♪ ♫, Science! Brent Parrish on The Inequality of Equality, and questioning the concept of “social justice.” It’s not too long, check it out. Where most Social Justice types get hung up is confusing fairness for justice. What’s fair is not always necessarily just. The hot trend among social justice crusaders nowadays is “income inequality.” This parallels another problem, which I believe is just as serious – Traffic Inequality. It’s not fair that Sunshine Mary and Donal Graeme, among others,¹ get more readers than I do. Clearly, the answer is to redistribute readers. Enacting a Minimum Traffic law would transfer excess readers from high-traffic sites to writers like myself who fall under the Readership Poverty Line. Seriously, does Mary really need all of her (as of this writing) 1,378,008 hits, compared to my 9,923? That’s over one million more hits, and she only started writing about 3 weeks before I did (and if we consider that those numbers only track her current site, I’m actually about 8 months ahead). If she cared, she would distribute some of those hits to the rest of us. Under the labor theory of value which many SJ crusaders seem to subscribe to, I should get the same amount of traffic as SSM, and more than Donal. So why should they get more traffic? Those others also post on a more consistent schedule than I do, which attracts and keeps readers. They also promote their work more than I do. They’re the 8 PM show five nights a week and get paid accordingly, whereas I show up Saturday night and hang around the parking lot after hours entertaining a few friends and passersby with off-the-wall stories for tips and free sodas. No one held a gun to anyone’s head and forced them to read SSM or Donal or whoever over me.³ Unfair as it might be, it’s not unjust. Trying to get readers from them by any means other than writing to suit the existing market – or finding a new one – would be coercion, which is both unfair and unjust. ¹ Waaayyy too many others. A pimp can’t catch a break these days. ² Stop smoking crack. Your mom would be so ashamed. ³ Okay, Donal might have. He’s tricky like that. Jesse Myerson posts at Salon Why You’re Wrong About Communism: 7 Huge Misconceptions About It (And Capitalism). …most of the greatest art under capitalism has always come from people who are oppressed and alienated (see: the blues, jazz, rock & roll, and hip-hop). Then, thanks to capitalism, it is homogenized, marketed, and milked for all its value by the “entrepreneurs” sitting at the top of the heap, stroking their satiated flanks in admiration of themselves for getting everyone beneath them to believe that we are free. Overlook the questionable claim that most great artists under capitalism were oppressed and alienated. (Were Lennon and McCartney, Berry Gordy, Duke Ellington, Leonard Bernstein, and Andy Warhol truly “oppressed and alienated”? How about Jackson Pollock? Thomas Hardy? Ernest Hemingway? Lawrence Olivier? Raymond Loewy?) Focus instead on the critical reality that, in fact, there are countless great artists, and Niagaras of profound art, produced under capitalism. The same cannot be said for communism. The reason is simple. Capitalism supplies artists not only with abundant materials and media for producing and sharing their works, but also with the freedom and personal space for them to create. In stark contrast, communism necessarily prohibits would-be artists from pursuing their muses. All means of production under communism are owned by the state, and, hence, remain off-limits to artists whose individual plans do not mesh with the central plan. I hadn’t seen Myerson’s piece when I did this post of my own earlier, but mine suggests a basic flaw in his claim – would a communist society permit a publishing house to print sympathetic stories about a character who fought for the enemy side in the biggest war it had ever seen? He’s half right about great artists often being alienated and oppressed. But this isn’t political, it’s social alienation… sometimes actively rejected by peers, other times because of their own issues which have nothing to do with anyone else’s reaction to them. Artists are usually different from most people. If anything, capitalism helps them reach out and speak to other rare people like them. There’s another way that capitalism has helped artists. In the 1950s, profits from their high-selling horror magazines allowed E.C. Comics to subsidize the science fiction books they wanted to do. Until Congress threatened to censor them, that is (shades of communism). 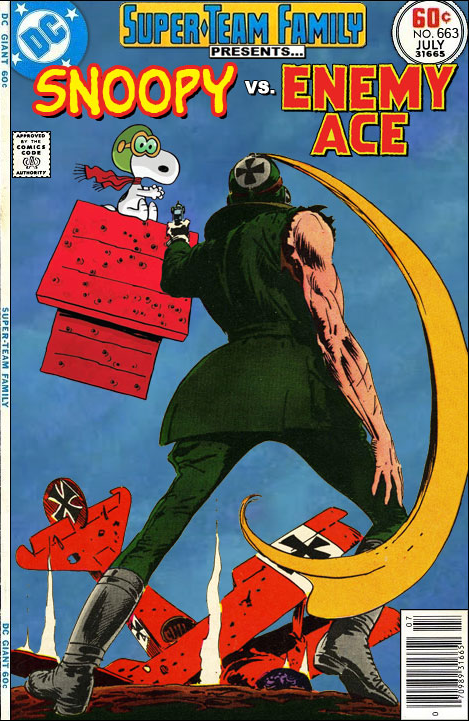 The World War I Flying Ace vs. his greatest nemesis…. 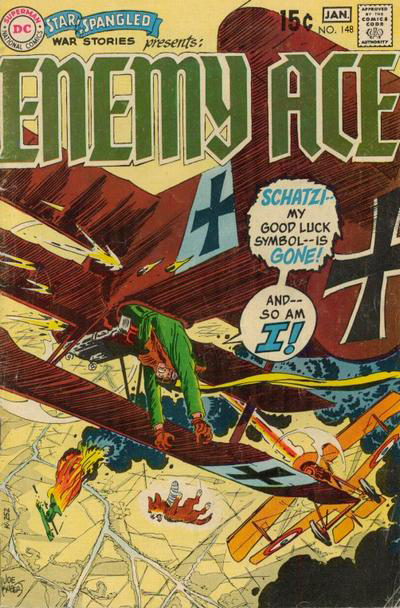 Enemy Ace??? 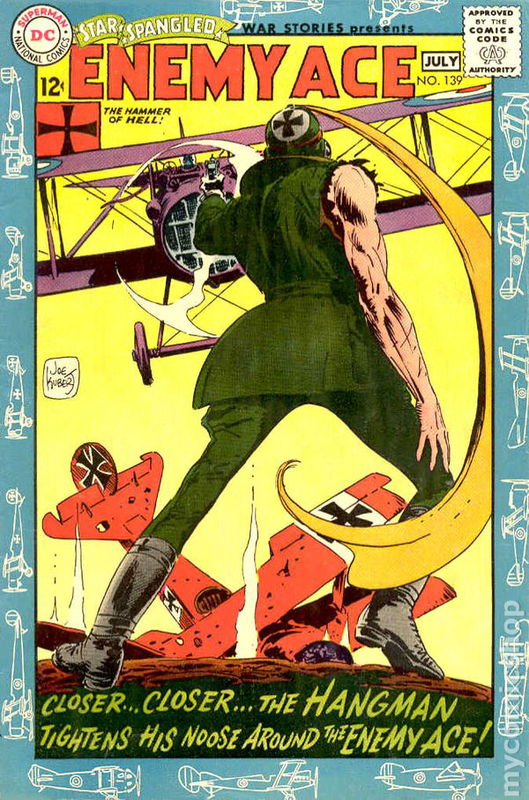 Enemy Ace was German World War I fighter pilot Rittmeister Hans Von Hammer, created by writer Robert Kanigher and legendary artist Joe Kubert. 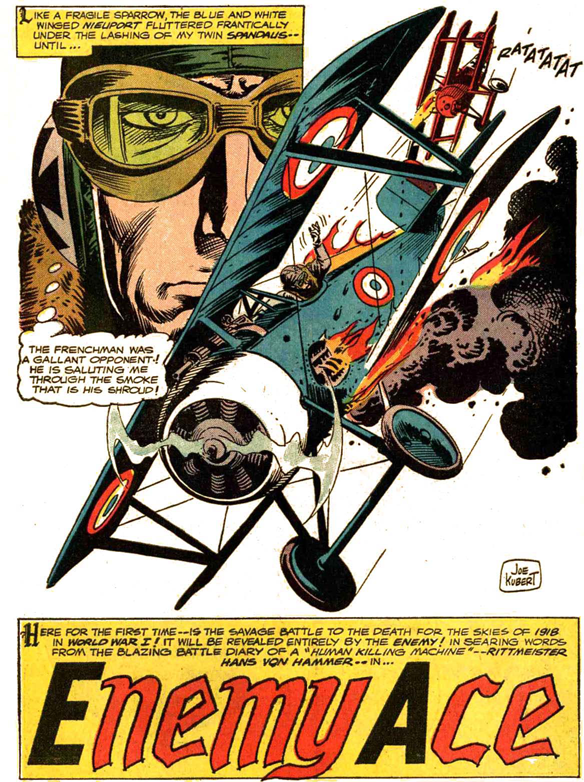 Known as “The Hammer Of Hell,” Enemy Ace appeared flying his signature Fokker Dr.I triplane in various DC Comics, primarily Star-Spangled War Stories. 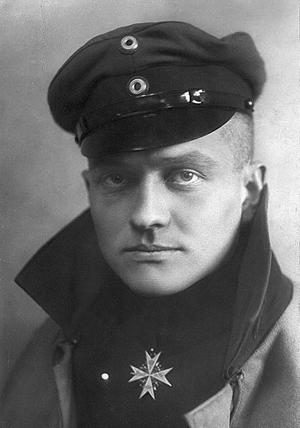 Enemy Ace was largely based on Manfred von Richthofen, better known as…. 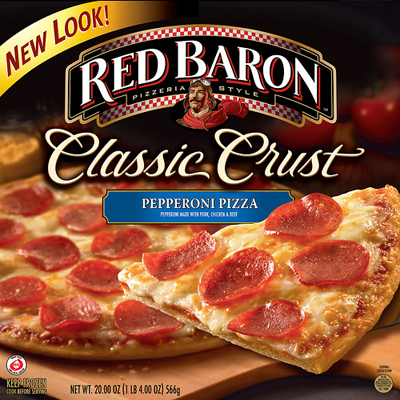 the Red Baron. The legend of the Red Baron was carried on by cartoonist Charles Schulz in his strip Peanuts, where Snoopy frequently hunted his opponent, and popularized to a level that if you’ve never seen Snoopy in a dogfight, you’ve been under a rock for decades.